Imagine a festival on the set of Dirty Dancing. Or the Shining. Or a combination of both. Imagine a festival where there is no branding or on-site sponsorships. Where the crowd only reaches 3000 people, max and you don’t have to line up for hours and purchase a beer with a drink ticket. Where there are no VIP areas or back stage hangs and the artists mix it up with the punters. Where all shows are indoors and the weather doesn’t matter. Add to that sets from three Australian bands (The Drones, The Dirty Three and Bridezilla) as well as Animal Collective, The Jesus Lizard, Sufjan Stevens, Suicide, Deerhunter and the Feelies. It’s not a dream, it’s All Tomorrow’s Parties New York. Elize Strydom and a bunch of other Aussies managed to score cheap flights and experience the magic. Photos of the live performances: The Drones, The Feelies, The Dirty Three feat. Nick Cave on piano, Panda Bear, Iron and Wine, Suicide, The Jesus Lizard and David Cross. The sun blasts Brisbane’s Riverstage bowl with pitiless intensity. The eyes almost hurt, and punters stake-out the little shade that exists as soon as they come through the gates. It’s a piercingly bright summer day that feels more suited to a day at the beach (or a Gunslinger showdown, for the more dramatically inclined) than the latest instalment of All Tomorrow’s Parties – the festival often dubbed “the ultimate mixtape”. Yet with the sun barely past the meridian, blues-jazz auteur James Blood Ulmer seats himself near the front of stage without fanfare and begins to play. The open space and bright light of the Riverstage is a world away from the smoky, intimate bars that birthed the blues, yet Ulmer is unperturbed. His be-ringed hands glide languidly across his guitar, generating poignant echoing blues music to make the hardest soul melt. In a way, the fierce afternoon heat assists, forcing the few hundred early arrivals to seek the shade at the front of stage. His talented fingers and crooning, quavering voice do the rest. Katrina – she “ran a whole lotta people outta town” – is, perhaps, the highlight, but every song is greeted with generous applause and by the time he departs the initially reserved Ulmer seems to have almost warmed to both crowd and setting. Avant-garde rock minimalists The Necks seem to confuse as many as they delight with a performance that’s not so much a set as a single instrumental movement. Over 45 unbroken minutes, pianist Chris Abrahams, double-bassist Lloyd Swanton and drummer Tony Buck construct, and then deconstruct, a hypnotic piece that blends their three instruments into a slowly evolving ocean of sound. With Abrahams facing away from his fellows, Swanton with eyes tightly shut, and Buck hunched studiously over his kit, there’s the overwhelming sense that the transitional cues are aural rather than verbal. But the true testimony to their skill is the organic fashion in which their initial gossamer web of piano and cymbals evolves into a portentous mass of deep bass tones and kick-drum thumps. By the end, we’re back to the start and wondering whether the intervening 45 minutes were merely a dream. Robert Forster tempers his patrician loftiness with a boyish enthusiasm and playfulness that’s quite endearing. Seemingly so excited to be at ATP that he kicks off five minutes early, he and his band members squeeze out 11 summery pop songs to perfectly match the balmy late-afternoon. The selection leans heavily to Go-betweens tracks, but Forster skips the hits for obscurer choices such as Head Full Of Steam, German Farmhouse and Make Her Day. Surfing Magazines and Quiet Heart form a lovely duo of charm and tenderness, while Darlinghurst Nights and the rollicking Here Comes A City illustrate why Oceans Apart garnered critical acclaim. It’s left to If It Rains, Pandanus and Heart Out To Tender to hold the fort on behalf of Forster’s impressive solo repertoire. J Spaceman’s (aka Jason Pierce) Spiritualized, incarnated for ATP as a seven-piece complete with a pair of wonderful gospel singers, bursts out of the blocks with the frothing, squalling admonishment of You Lie, You Cheat. What follows leaves the crowd spell struck, and proves a mere 45 minutes is hardly enough to fully appreciate the complex beauty of a sound that threads together rock, psychedelia, gospel and blues. Word wankery aside, it’s divine, and choosing a highlight is nigh-impossible. The bliss-out space-rock of Ladies And Gentlemen We Are Floating In Space? The plaintive, hopeful poetry of Shine A Light? The anthemic grandeur of Soul On Fire? Or perhaps the wonderful, country-inflected rendition of Spaceman 3 classic Walking With Jesus? By the conclusion, if I wasn’t already, I think I’m in love, because the gospel singers just own Come Together, for all that they leave stage before the wig-out finale of guitar cacophony. Surely no act on today’s ATP bill is more anticipated than The Saints. Billed to perform their seminal debut album in order, in its entirety, and with original members Ivor Hay and Ed Kuepper joining Chris Bailey, there’s a palpable feeling that the home-town performance could prove one for the annals. Anticipation peaks as the band emerges to the strains of bagpipes and Kuepper and Hay fire up. The joy is short-lived though. They open not with (I’m) Stranded, but Swing For The Crime – a cut from 1979′s Prehistoric Sounds. Shock and surprise soon turn to deflation and disbelief as they transition into This Perfect Day and it becomes clear that, somewhere, there’s been an unannounced change of plans. In the end, only five out-of-order songs from (I’m) Stranded feature in the brief eight-song set. Criminally, not one is the title track. Equally mystifying, the mix is nothing short of appalling, reducing the crisp, ferocious beauty of Kuepper’s guitar to indiscernible droning sludge. The best moments come from the bluesy Kissin’ Cousins and a slow-tempo version of Messin’ With The Kid where Bailey’s acoustic guitar helps rather than hinders. But the verbal abuse sections of the crowd hurl at the departing band after they conclude with a disappointing rendition of Nights in Venice highlights how much of a letdown they were tonight. Know your product? Apparently not. 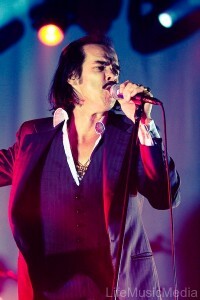 After The Saints, Nick Cave & the Bad Seeds are left with a lot to do. Fortunately, their 90-minute set is an absolute barn-burster that completely erases the sour taste left by the The Saints‘ lead balloon. All energy, gusto and unignorable charisma, Cave prowls the stage, alternately treating his guitar with violent disdain and imperiously lashing the audience with his evocative lyrics. It only takes a few songs to grasp that the act of creating Dig!!! Lazarus Dig!!! has propelled the Bad Seeds’ passion for live performance into the stratosphere. Dual drum kits intensify the bottom end while the regular mandocaster wig-outs of Warren Ellis push many a Bad Seed classic to the edge of mania. And even if there’s a touch of greatest hits about the selections, there’s a frightening intensity in the delivery. Tupelo, The Mercy Seat, Papa Won’t Leave you Henry, The Weeping Song – all are simply searing. Red Right Hand benefits from a softer club-lounge re-arrangement of soft ivories, brushed drums and finger-plucked fiddle – dramatic yet intimate. Then, in a flash, it concludes in a mania of sawing violin, mashed piano and crashing cymbals. Love Letter and The Ship Song form a quieter mid-set interlude, and amidst the older material, tracks from Dig!!! Lazarus Dig!!! emerge needle-sharp and glorious. The title track, as well as Midnight Man and More News From Nowhere, show signs of becoming instant classics. Only the demented We Call Upon The Author strikes an off note in its awkward transition into Ellis’s post-chorus funkified loops, but Cave’s vocal delivery is so fluid and poetic that it more than balances the ledger. Anyway, it’s surely nothing a pair of scissors can’t fix. Cave demands audience participation as the band encore. But the crowd’s ragged call-and-response effort for Lyre of Orpheus prompts him to remark sardonically at the end: “Well, that was messed up”. The unrelentingly fierce rendition of Get Ready For Love that follows feels almost like a punishment for our collective misdemeanour. Unfortunately, all good things must come to the end, but the Bad Seeds have arguably saved the best for last, finishing with the stunning murder ballad Stagger Lee. From start to finish, it’s been a tour-de-force of no equal. And as we all drift off into the night, I muse that, bar a single act, ATP has been peerless too. 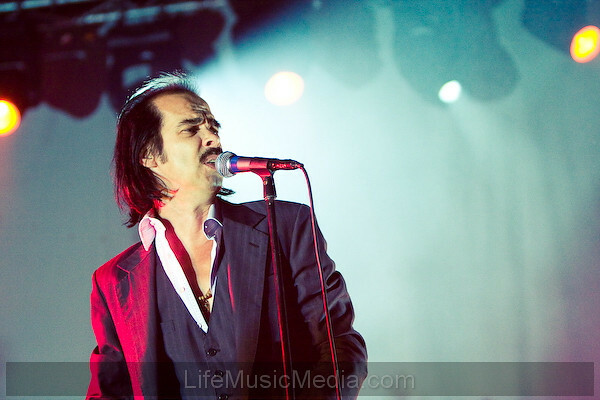 For the inaugural Australian series All Tomorrow’s Parties (ATP) have announced that arguably the most significant Australian export of the last twenty years Nick Cave & The Bad Seeds, are to make their curating debut. The Bad Seeds intimate knowledge of all things Australian (music and otherwise) coupled with their innate sense of the weird and wonderful will – we are sure – make for a series of very unique events. 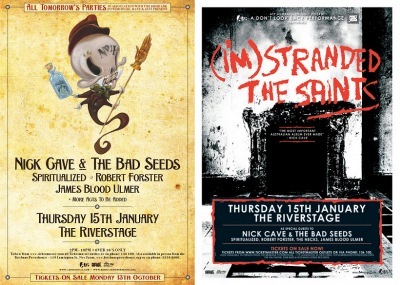 Arguably Australia’s most successful cultural export of the last twenty years, Nick Cave & The Bad Seeds – both collectively and individually – are also the most prolific. 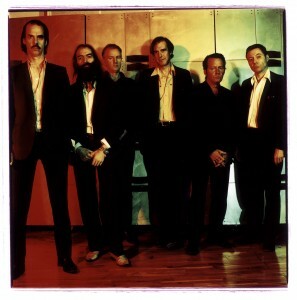 In the last eighteen months alone, Nick Cave, alongside fellow Bad Seeds; Warren Ellis (violin, mandocaster) Martyn Casey (bass) and Jim Sclavunus (drums), have released an album and toured under the name Grinderman – a bump and grind exaggeration of the Bad Seeds groove. Warren Ellis and Nick Cave have also written and released the soundtrack to the Brad Pitt produced movie The Assassination of Jesse James by the Coward Robert Ford; bassist Martyn Casey has revived his former role in the reunited Triffids performing at last year’s Sydney Festival; and the longest serving Bad Seed, Mick Harvey (guitar and organ), has released a solo album (his fourth) entitled Two of Diamonds. Harvey has also performed as guest musician at The Triffids reunion shows and most recently has been remixing the entire Bad Seeds back catalogue in 5.1 surround sound.